In 1955, eight communist countries signed the Treaty of Friendship, Cooperation and Mutual Assistance to oppose NATO. 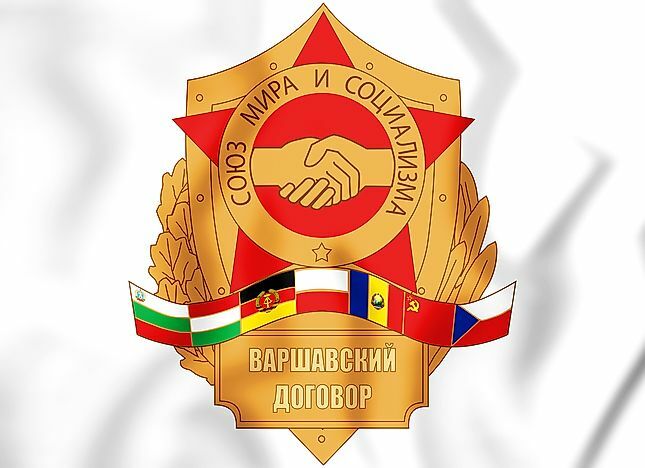 Badge symbolizing the Warsaw Pact and its "Union of peace and socialism", depicting the flags of the signatory nations and shaking hands. The Warsaw Pact came into being after the socialist republic of Czechoslovakia came to increasingly fear the bolstering of armaments of West Germany by its Western Allies, and wanted to create a pact with fellow communist European states. After the end of World War II, the countries which were to be brought under the banner of the North Atlantic Treaty Organization (NATO) did not confirm their consent to supporting Czechoslovakia, the Soviet Union, and other socialist republics. As a result, in 1955 on the 14th of May, the Warsaw Pact came into being. This pact was signed by the eight countries of Bulgaria, Czechoslovakia, East Germany, Hungary, Poland, Romania, the Soviet Union, and Albania, and the pact was known as the "Treaty of Friendship, Cooperation and Mutual Assistance". The basic objectives of the formation of this historical pact were to give the Soviet Union the right to keep its troops stationed in its allied "satellite" countries. It also emphasized its role on the non-interference in each other’s internal matters, and that it should be organized for the making of the collective decisions, and that most of the regulations of the pact were controlled by the Soviet Union. One main objective was that they wanted to seize the territories from the Fulda Gap to the Rhine River in order to destroy the NATO forces by dividing them, and to capture the city of Frankfurt to pressure the Western forces to surrender their claims in Germany. The Soviet Union wanted to take the area of Central and Eastern Europe for its own, and it was even seen that the country was looking towards its own, rather than the common interests, during the pact. The rising military force of West Germany, and its influence on neighboring Czechoslovakia, was a major challenge being faced by the Soviet Union, and therefore this pact came into being. Some of the neighboring countries like Poland and Hungary also showed discontentment because of the presence of Russian troops in their own countries. The inter- and intra-bloc conflicts were noticed after the making of this pact, and the tensions started prevailing amongst the nations, and the matter regarding the respective leadership also came into play, as the Warsaw Pact leadership was largely comprised by Soviet Russians. Several countries of the Warsaw Pact jointly invaded fellow member Czechoslovakia in 1968 following the political reform movement known as Prague Spring. Albania withdrew from the Warsaw Pact shortly thereafter. After the disintegration of Soviet states and the power of the country also came to an end, with this it was seen that the Warsaw Pact also met its fate. The Warsaw Pact's end came on the 31st of March in the year 1991. This ended a 36-year-old alliance between the seven European nations (Albania had already been gone for more than two decades, leaving 7 of the original 8) who had signed this treaty. The military troops of the Soviet Union were withdrawn from the neighboring countries, and this time saw an end to one of the most powerful military alliances in human history. The Warsaw Pact also carries great historical significance, as the member nations pledged to help each other in the most adverse of times. It saw to the carrying out of joint military exercises, the training of the collective countries' troops, and helped the Soviet Union to conduct a wider range of research to bolster its defense and to compete with the production of weapons by the rival European countries and the United States. The pact also helped to maintain the cohesion in the Russian-dominated Eastern Bloc, and served as a reliable instrument for promoting the policies of the Soviet Union in the Third World.